Indian purple yam recipes, kand recipes. suran recipes. Kand, commonly known as purple yam, is quite adorable to most just because of its pruple colour and mildly sweetened taste it possess. In the market, this fleshy root tuber is usually available in different shapes depending on its variety. When you need to choose the best purple yam, choose the one that is firm and does not have any cracks, bruises or soft spots. Upon getting it home, purple yams should be stored in a cool, dark and well-ventilated place where they will keep fresh for up to ten days. Kand has a very homely taste, which is liked by everybody, both children and adults. It can be used to make a variety of recipes ranging from morning to evening, from Starter to Main Course, Kand can be used to make a wide range of mouth-watering delicacies. What is the most famous purple yam, kand Indian dish ? From Gujarat, we have the traditional Oondhiya recipe which is associated with kand. We also have the healthy Oondhiya recipe which uses lesser oil. Purple Yam, Kand is used in Faraal recipes. Indian love fasting ( during Sankashti Chathurthi, maha shivaratri, Ekadashi) ) and purple yam is used very often. Crispy and flavourful pakodas made of yam, potatoes and crushed peanuts, the Kand Aloo Pakoda is good company for a cup of hot masala chai on a cold winter’s day. The best part is that this tasty treat can be enjoyed in fasting days as well. Layered Handvo farali recipe is tempting paneer teamed with spicy green chutney is sandwiched between purple yam and potato and baked to perfection. Kand wafers recipe is another super farali snack which my kids love. puple yam Indian snacks. Try the kand sandwich recipe which is nothing but simple slices of purple yam sandwiched with green chutney and toasted in a non-stick tava. Kand and potato rosti recipe is an innovative snack and variation to the Swiss rosti. Here purple yam is added to the grated potatoes and then the recipe is tweaked to add green chillies, lemon juice and peanuts. This is also a perfect recipe for ekadashi. Like all traditional bhajias, kand na bhajia is also made by deep-frying thin slices of purple yam dipped in a gram flour batter. purple yam Indian ​stir fry recipes. Kand Stir Fry recipe features purple yam, stir-fried with a traditional tempering and seasoned with crushed peanuts and lemon juice. This gives the Purple Yam Stir Fry a unique texture and a very enjoyable flavour, which is a mix of peanut’s musky flavour and a lemony tang too! Is purple yam, kand, suran healthy? Kand (Purple Yam) : The antioxidant anthocyanin is the key element which will help fight the free radicals produced due to stress and pollution. Again it’s the anthocyanin which is identified as an anti-cancer agent. It helps in the prevention of cancerous cells. Purple yam is fairly good source of carb, almost equal to potatoes, it would be best for diabetics to restrict its use. Fiber will bind cholesterol, while potassium will balance the effect of sodium and ease the nerves. However, kand also lends some carbs with it. So if you are overweight or diabetic along with exhibiting heart trouble, try and restrict its consumption. Read details is kand healthy? 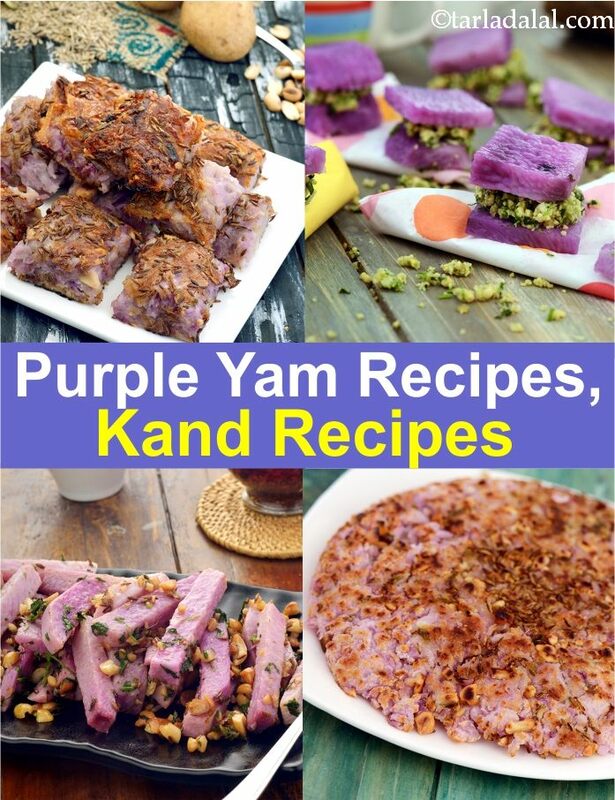 Enjoy our Indian purple yam recipes, kand recipes below. Oondhiya is one of gujarat's culinary treasures! here is an interesting version i arrived at while experimenting by grinding sprouts instead of fattening coconut, you get a healthier recipe without compromising one bit on taste. Usually oil-laden, this Gujarati favourite gets the healthy treatment through pressure-cooking and baking and replacing poha for high fat coconut!